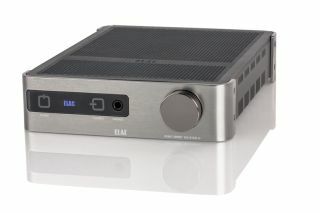 Elac Element EA101EQ-G amplifier has room calibration and app control | What Hi-Fi? This new ELAC amp promises to adjust the sound to suit your room. A new hi-fi amplifier from Elac may not instantly get your pulse racing, but this new model has a smart, compact profile, supports stereo and multi-channel signals, and has a few neat features to help it stand out. The two key calibration features are Auto Blend and Calibrate, and you operate them using an app on your smartphone or tablet. Auto Blend determines the ideal crossover frequency and phase relationship of the subwoofer and main speaker, and then optimises how they work together. Calibrate then adjusts the sound to the acoustics of your room. So you should be able to enjoy the amp at its best, whether you're in the lounge, shed or anywhere else in the house, and should you move it from one position to another. Inside, Elac's BASH technology aims to fuse the best of Class D and Class AB amplification, for a blend of performance and efficiency - that's the claim, at least. The amp can also decode multi-channel Dolby Digital signals, while there's Bluetooth on board for wireless streaming from your phone or tablet. The amp comes with a learning remote, so it can take control of your TV and set-top box, too. The Elac EA101EQ-G will go on sale this month, with a recommended retail price of €699 (£604).